Audio over IP decoder with line-level audio outputs, USB flash interface, IR receiver, LCD display and relay, low power, multi-format (MP3/WMA/AACplusV2,PCM,Ethersound) support. 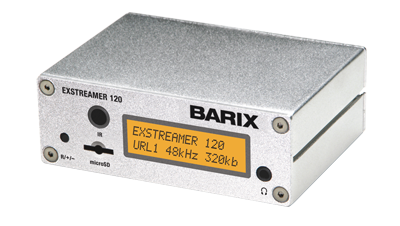 The Exstreamer 110 IP Audio Decoder decodes and plays multi-protocol and multi format audio streams, including MP3, AACplusV2, WMA, PCM, G.711, Ethersound. It features a stereo line-level output, headphone connection, low power consumption and a relay output that can be used to activate amplifiers. An LCD display can show title information and aid with device setup. 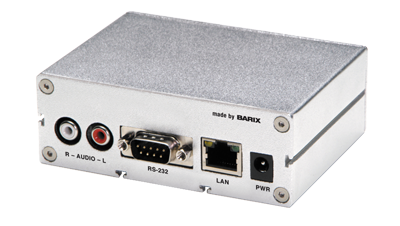 The builtin IR receiver and included IR remote control allows channel selection and volume control.